It’s amazing what the human voice can do. I was reading about the coloratura – that’s a high soprano – who is currently singing the highest note ever heard in the 137-year history of the New York Metropolitan Opera (an A above high C). That’s a note up in the stratosphere. Thrilling! I’ve heard a recording several times and am mesmerized every time. I bet each of us can identify a gifted voice that stops us in our tracks, moves us out of the ordinary, a voice that thrills and wakes us up. And it might well belong to a singer – opera or otherwise – or it might be a recording of powerful orator such as Dr. Martin Luther King Jr, or it might be that one familiar voice you will always remember - your mother or grandmother, your spouse or your child. My sister saved an old voice message from my dad on her phone so she’ll always have the sound of his voice. What do I notice in the readings for the Second Sunday of Advent? – I notice what the human voice can do. I counted in these readings at least 20 verbs or nouns connected to speech. · The prophet Isaiah speaks tender words of comfort, cries out encouragement that good news is just around the corner, because God is with us. · The psalmist leans in, strains to listen for the peace that God will speak. · In Mark’s gospel, the Messiah’s prophet appears in the wilderness and proclaims that it’s time, now, to turn around, to get ready for the One who is coming, the One who is always with us - Emmanuel. The Creator God who spoke us into being with the Divine Breath, speaks through the messenger’s voice today. · or maybe the message is accompanied by flashing strobe lights today…the alert that says it’s time to pay attention to your life; tell the truth about your experience; time to forgive, or challenge, or ask forgiveness. · the response to James Martin’s book Building a Bridge, about how the Catholic Church and the LGBT community can form relationships of respect. I read about an elderly couple who drove a long way to hear his lecture in Boston. Speaking through his tracheotomy, the husband cried as he told how his gay son was maligned in a church that teaches us, first and foremost, to love one another. We need reviving; our families need comforting; our church needs to pay attention; our world needs peace. And that’s what the human voice can do…yours and mine. We can speak a word that affirms a child, challenges a politician, forgives a friend. We can have honest conversations; stop keeping secrets; tell the truth about our lives. We can speak up for someone no one else is listening to. Yes…let us hear what God proclaims through you! 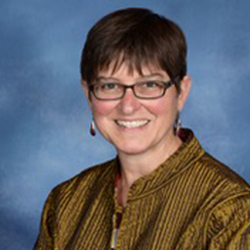 Lisa Frey has served in ministry at the Church of the Resurrection in Solon, Ohio since 1991. In addition to shared pastoral care, faith formation, and administration of the parish, her areas of responsibility include social justice, outreach, wellness and bereavement. A lifelong learner, she earned her Master of Arts in Theology at St. Mary’s Seminary in Cleveland and Doctor of Ministry in Homiletics at the Aquinas Institute of Theology in St. Louis. Her doctoral thesis was titled, “Silence in Support of Speaking: How Reflective Practices Can Lead to Transformative Preaching.” A native of Northeast Ohio, Lisa enjoys the Lake Erie shoreline in all seasons.